Let’s talk about staff in Jeffco Public Schools. Jeffco has always been a leader and a choice district for educators and families. That’s $481,284,503 taken away from our school district since 2009. How does that impact Jeffco kids? 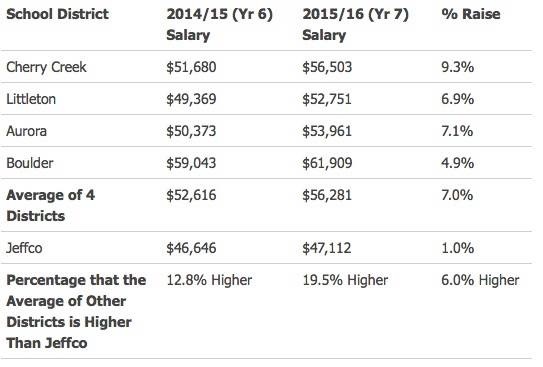 If you’re planning on taking a job as a teacher, which district would you choose? Certainly, the kids in Jeffco are just as cute and just as smart as the kids in those other districts. Certainly, there is a state-wide issue regarding education funding. Certainly, we want the best for our kids in Jeffco and that means experienced and quality educators. Shouldn’t we start talking about making educators a priority and at least attempting to be competitive in pay? Educators also have families, homes, cars, electric bills, and need groceries. It’s time to start talking about how we are going to stop the exodus and keep our treasured staff here in Jeffco. Please share this and include your thoughts on how we make Jeffco the most desirable district to educators. Their work environment is our children’s learning environment. YOU tell US! What is YOUR solution? Post on facebook or email us at admin@supportjeffcokids.org. Previous PostWhen Will Constituents Be Given A Voice?Next PostCall to Action for Music!